If you're interested in rental property, most likely you are interested in the passive income that can be earned from your investment. Whether that it is a huge reason for your investing or only a minor one, the reality is that there is a huge opportunity to earn cash each month from the properties you rent. When analyzing deals to determine whether you should make an offer, often we focus so heavily on the hard numbers of the property to determine if it is a good deal: price, insurance, taxes, utilities, interest rate, down payment, rental income potential, etc. In NO way at all am I discounting the importance of these numbers. Running the numbers on potential deals is extremely important to ensuring that you don't throw your money into a bad deal. However, there are other areas where you are earning 'cash flow' that you might not see in your bank account every month, but makes an impact on your overall investment and return. Depreciation, mortgage interest reduction and principal pay down are three major pieces of the real estate investing puzzle that you should also consider when analyzing a potential deal. In today's show, we break down how these three important, but often overlooked, elements of a deal play into the overall analysis of a property. 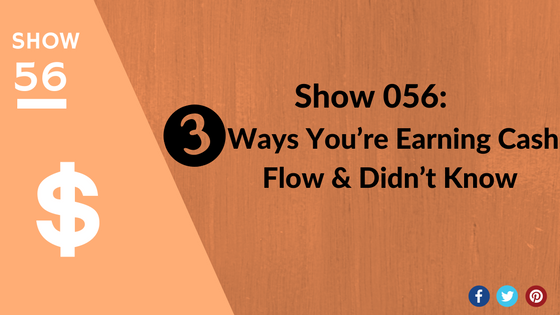 I'll be the first to admit that I've often had a hard time really understanding these three elements, so tune in to hear about how you earn cash flow each month even though you don't "feel" it.